3.4 out of 5 based on 34 bloggers and 4 commenters. 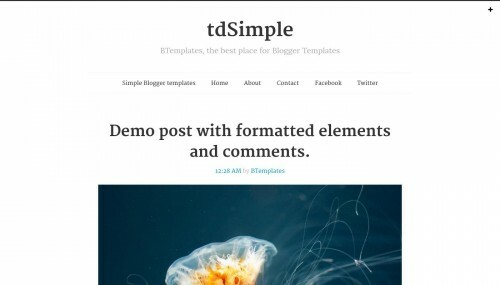 tdSimple is a free blogger template adapted from WordPress with 1 column, responsive design, seo friendly, right sidebar, minimalist, posts thumbnails, drop down menu, simple look, neutral colors and tumblr style. Excellent template for blogs about any general topic, art, to write a diary, photography or a personal portfolio site.